Nostalgia can be a dangerous thing. Why? Because for every Crash Bandicoot N. Sane Trilogy we get a Night Trap, the Sega Mega-CD full motion video cult ‘classic’ that sees you save a group of ’90s teens from stalker vampires, horny boys, and bad hair. Don’t get me wrong, I’ll be ‘partying hard’ with the teens of the Trap when it releases, but I’ll hate myself afterwards. I’ll need to schedule a binge-play of Overwatch to clean my soul and wipe away the memory of Megan’s yoga pants. 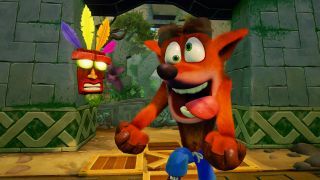 Nostalgic remakes and remasters play on our need to rekindle that sense of excitement we had when games felt new and fresh. It taps into a collective anxiety that encourages us to believe games releasing now are lacking an intangible special something that was inherent in every game released ‘back in the day’, when back-combed hair was in fashion and everyone was called Todd or Chad or Cynthia. But the idea that games today can’t offer the same sense of wonder is saddening. After all, we live in an era of PS VR, online marathons, and an indie dev renaissance. Surely we should have enough new ideas and experiences to put the likes of Night Trap to bed, so to speak. Consider this too: at one point in time, in the 18th and 19th centuries, nostalgia was considered an illness. It was a danger to your mental health. That feeling of loss and yearning for your childhood was seen as a genuine cause for concern. Back then, those feelings would have been knocked out of you in a sanitarium. But we live in more enlightened times, and prefer to package up our emotional connections in a collector’s edition, our childhoods gloriously remade in 4K with a free bobble-head and keyring. Is nostalgia in danger of holding back popular culture, and games in particular? Film is already plagued by remakes at the expense of genuine new, creative visions. Do we want our game devs to follow suit? There’s an argument that says we love nostalgic games because we fear the current state of things; we fear the complexity of modern gaming, the always-online campaigns, co-op marathons, and myriad Dark Souls-alikes out to punish us. Do we risk retreating into easily digested retro remakes? Hiding behind the comfort of what we know, or once knew, rather than embracing fresh ideas? I hope not.